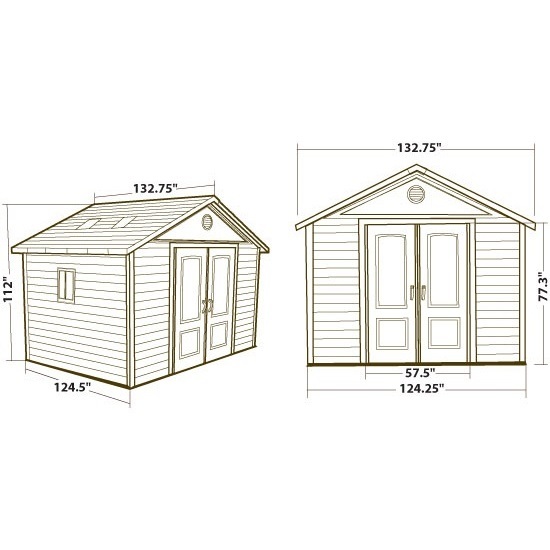 Interior Headroom (truss to floor) - 89"
The snow load capacity is 22 pounds per square foot for out 8' sheds and around 16 pounds per square foot for our 11' sheds. The walls anchor into the included floor. The floor/shed does provide spots in the corners to be anchored into the concrete. I found the instructions easy to follow. I would modify 1 or 2 steps to speed assembly of the roof framing. I was able to on 99% of the assemble by myself. In all this was easy to do and it looks great and meets the need for purchasing of the building. Ordered the shed on a Sunday and had it in my driveway by the next Friday! Product was shrink wrapped and did not even have a dent on a box. Shipper was top notch! I am pretty handy and watched several you tube videos on the installation ... the videos helped a ton! 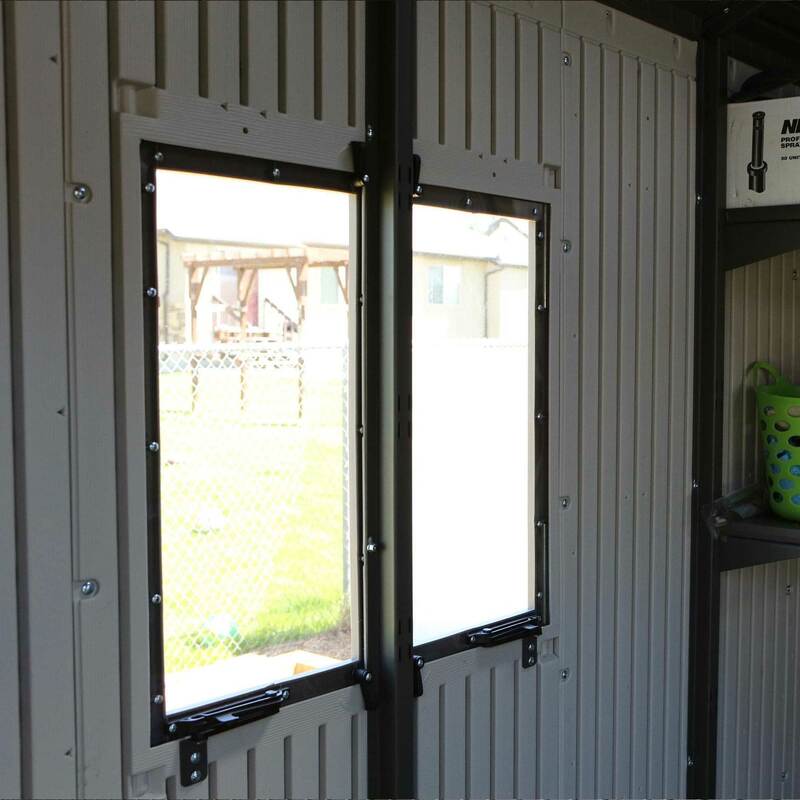 The screws are all packaged for each section of the instruction, which was very helpful, most of the actual parts did not have part numbers but from watching videos and using common sense the shed went together with ease. 2 men 6 hours fully installed! Would recommend these sheds over any others ... and trust me I researched all of them! This is a great shed! Shed arrived well packaged on a skid shrink wrapped in 4 boxes. We checked contents of all boxes to ensure all parts were delivered and to inspect for damage. No problems with missing or damaged parts. Directions are lacking! Pictures are included but are hard to make out in some instances. Better written instructions in support of pictures would be a benefit. Parts labeling would have helped a great deal! Separating all parts and stacking with like pieces helped us. Great fit when assembling shed. Very solid when finally assembled and anchored to cement slab. I still have to assemble and install the shelves. Customer service was extremely courteous and helpful (shed shipped 1 week after it was supposed to). It took 4 guys 8 hours (1 hour off for lunch) to assemble. Much of the time figuring out the instructions. I spent almost 2 hours hammer drilling into the slab to anchor the shed. I have had great comments on the shed from friends and family. I would definitely recommend this shed and Competitive Edge! We had the 11x11 along with 2 extension kits shed for 2 years now and recently had a huge 60 ft tall tree fall directly on it. I wish I could attach a picture here to show how well the shed held up. Sure there are supports, roof, and wall panels that need replacing but in all the shed took quite a hit with minimal damage and the contents inside were virtually untouched. Lifetime was extremely helpful with ordering of replacement parts. I can't say enough of how happy we are that we purchased this shed. 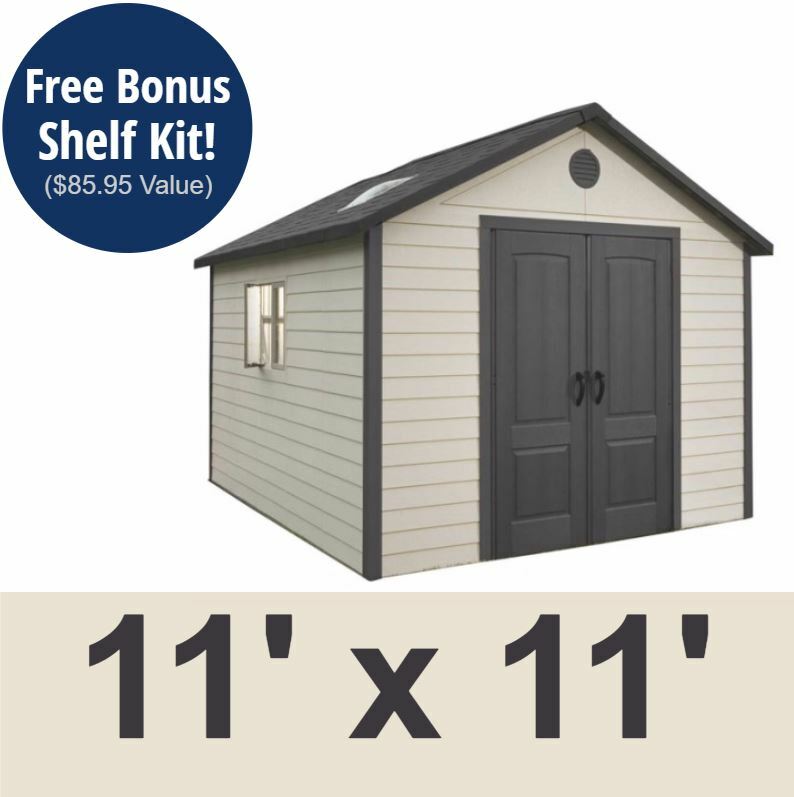 Not to even mention the fact that this shed requires no maintenance, no wood to rot out over time. We feel this was a great investment! Thanks, Lifetime! 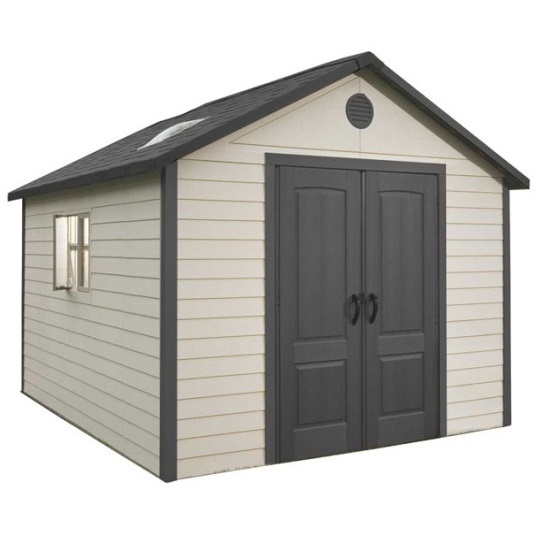 Q: Can you paint sides of shed gray before shipping? I am ready to purchase. 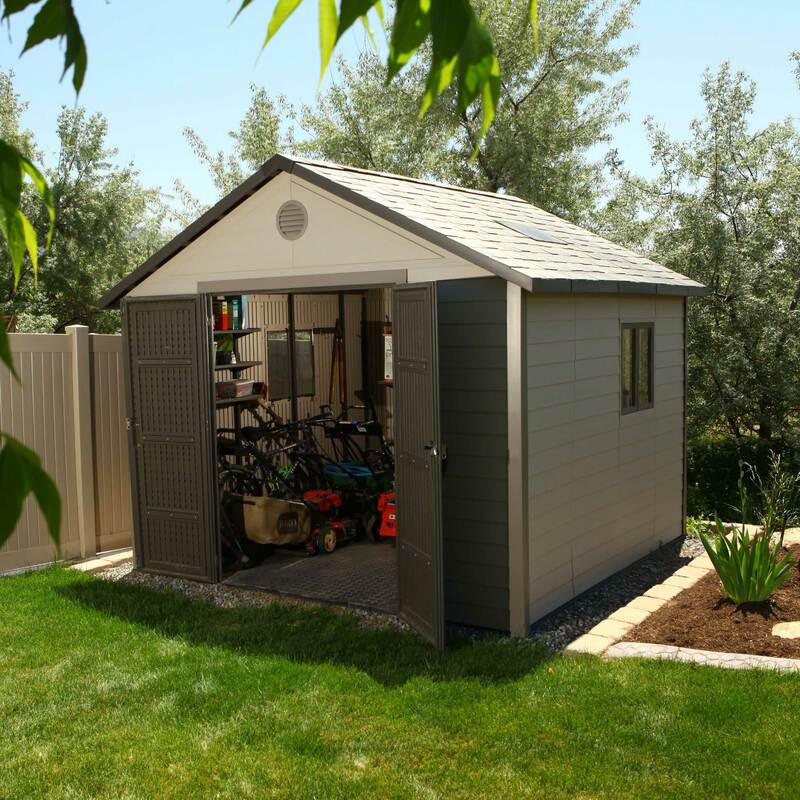 A: Unfortunately, you cannot paint these storage sheds-the lifetime brand storage sheds. They are made of polyethylene and paint does not like to stick to that. That's good news though, because neither does dirt and other materials. It keeps it looking nice and clean. Q: I have an asphalt ground. 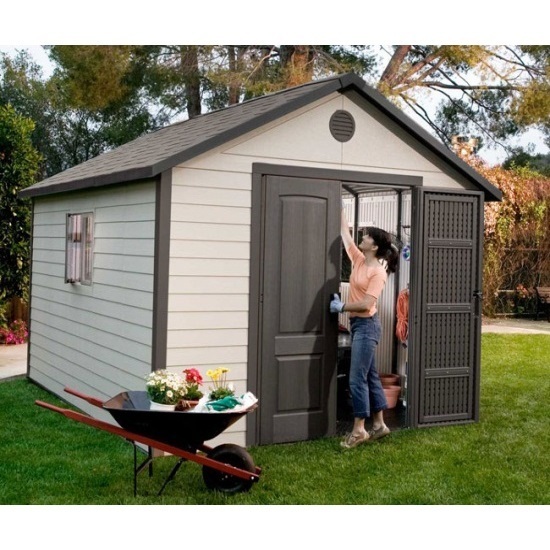 Can shed be mounted to it? A: The manufacturer recommends placing this either on a concrete slab or on a wooden base. Sometimes customers will put this directly on asphalt or P gravel and it works just fine. However, if it is not completely level you may run into issues with the doors closing properly or other assembly issues. 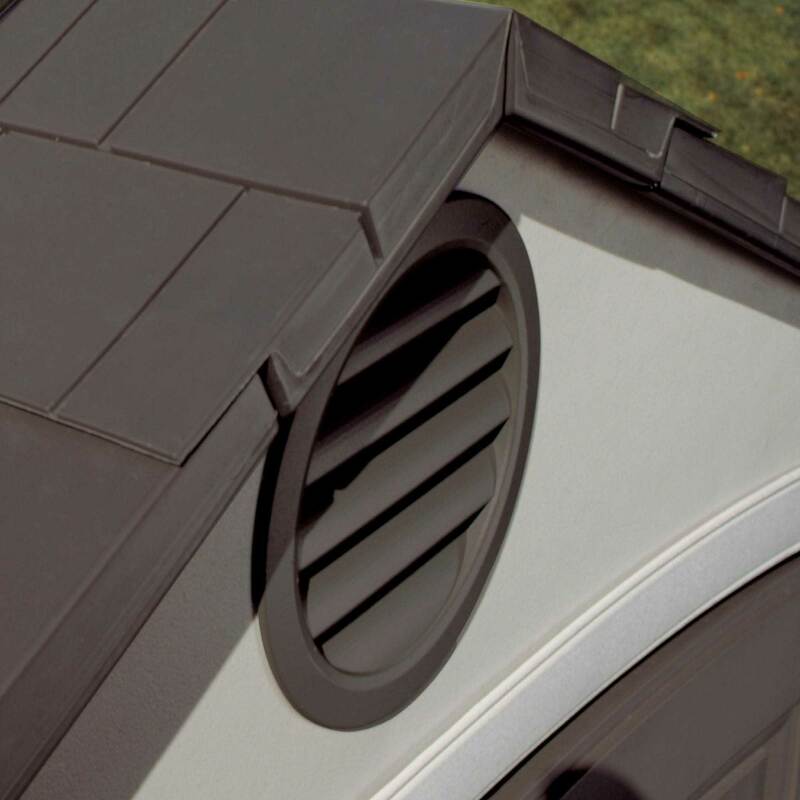 Q: What does “simulated” roof tiles mean? A: That's a very good question. The simulated means that it simply looks like roof tiles. They are 30 inch sections of plastic roofing, but they are molded to look like a regular roof with shingles. 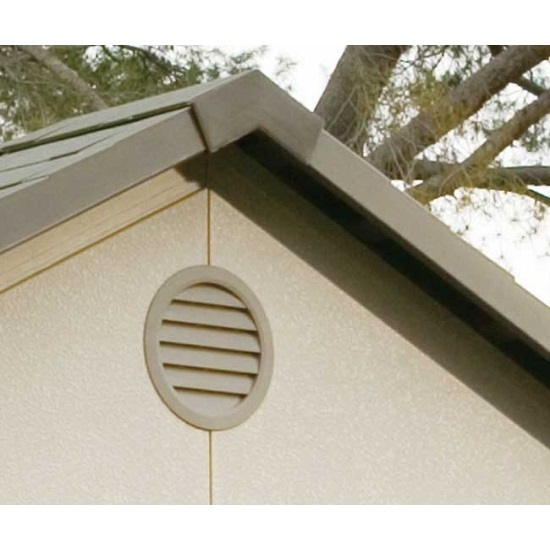 A: It simply means that it is designed to look like real tile or shingles on a regular roof. A: For assembly I'd recommend Service Connection. They do installation in every zip code and they'll give you a quote if you call 855-544-8854. 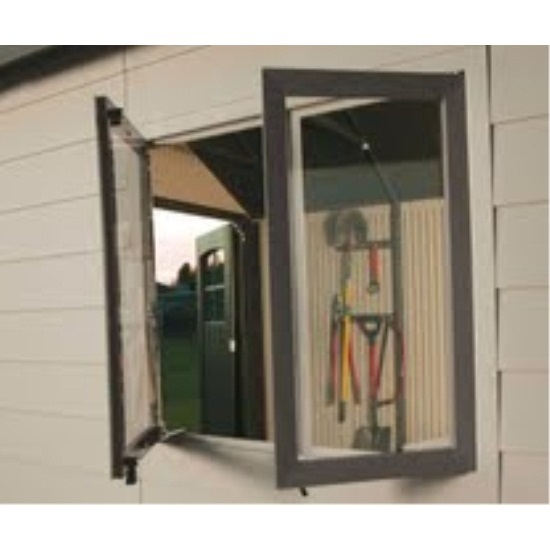 Q: can you interchange the window panel with the panel one the opposite side ? A: Yes, those panels are interchangeable. A: 'm sorry, but we do not offer assembly services. Q: WHAT COLORS ARE THESE SHEDS? 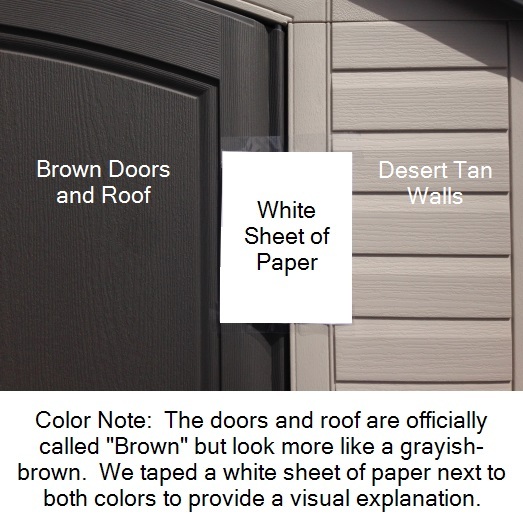 A: The Lifetime sheds all have the same coloring, which is a desert tan for the walls and a dark gray for the roof and doors. Q: Is this difficult to put together? Do I need to hire someone? A: The assembly is quite easy with the exception of the base. If you have a concrete slab, then you are set. If you need to build a wooden base or foundation that can be intimidating. The instructions do show you exactly how to build that so for most people they do not hire it out. Sometimes people will hire out the base for the concrete work only and then assemble the shed. 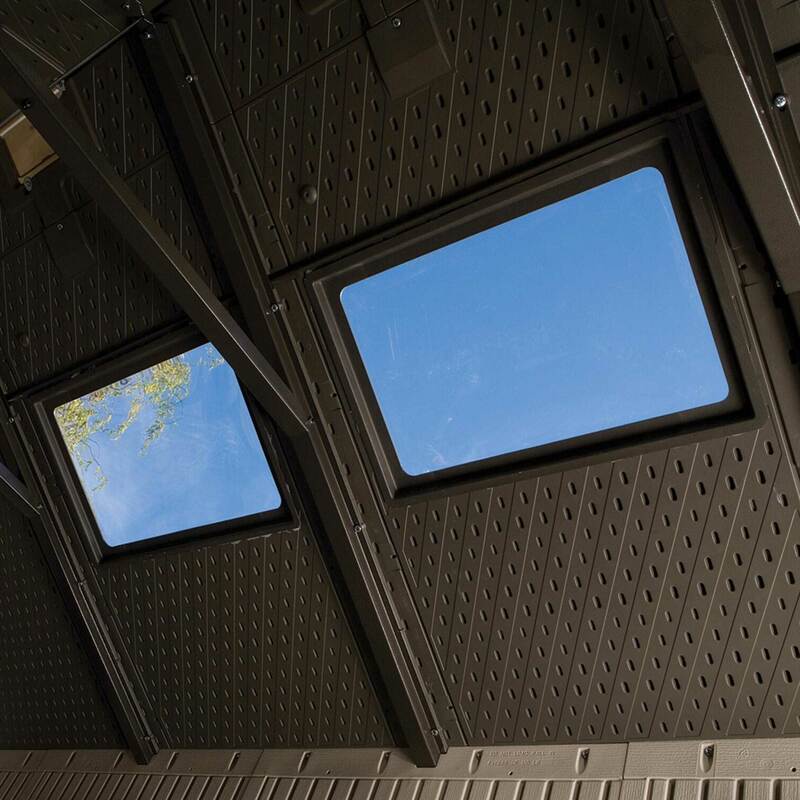 The shed is designed for the homeowner to assemble-in other words, it usually isn't necessary to hire a contractor or handyman to build it. The average person with the help of a friend can complete the assembly on a weekend easily. Q: Does this lock securely? 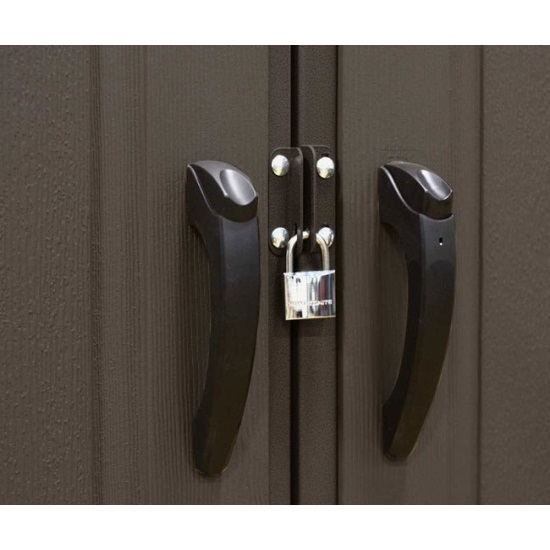 A: The doors reinforced with steel around the perimeter and this has a padlock loop to keep it secure. 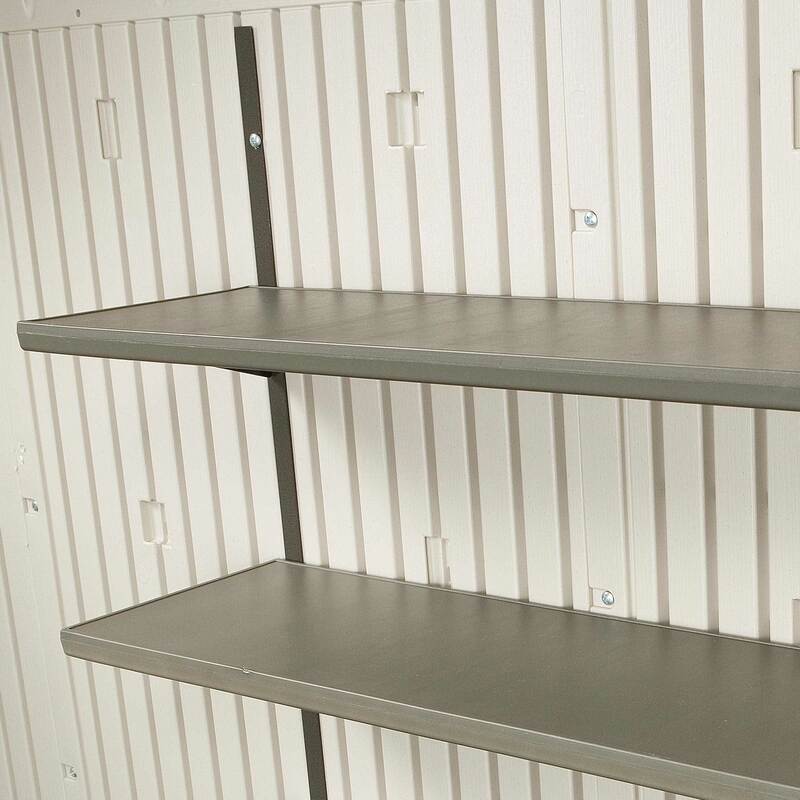 Shipping: Orders for the 6433 Lifetime Storage Building generally leave the warehouse the next business day. 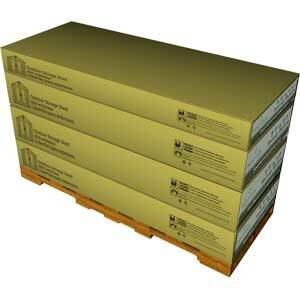 Shed model 6433 comes in 4 boxes. Box 1 is labeled as 64331 and weighs 280 pounds, 81 x 32 x 12. Box 2 is labeled 64332 and weighs 243 pounds, 81 x 32 x 13. Box 3 is labeled 64333 and weighs 128 pounds, 81 x 32 x 8. Box 4 is labeled 64334 and weighs 165 pounds, 81 x 32 x 12. 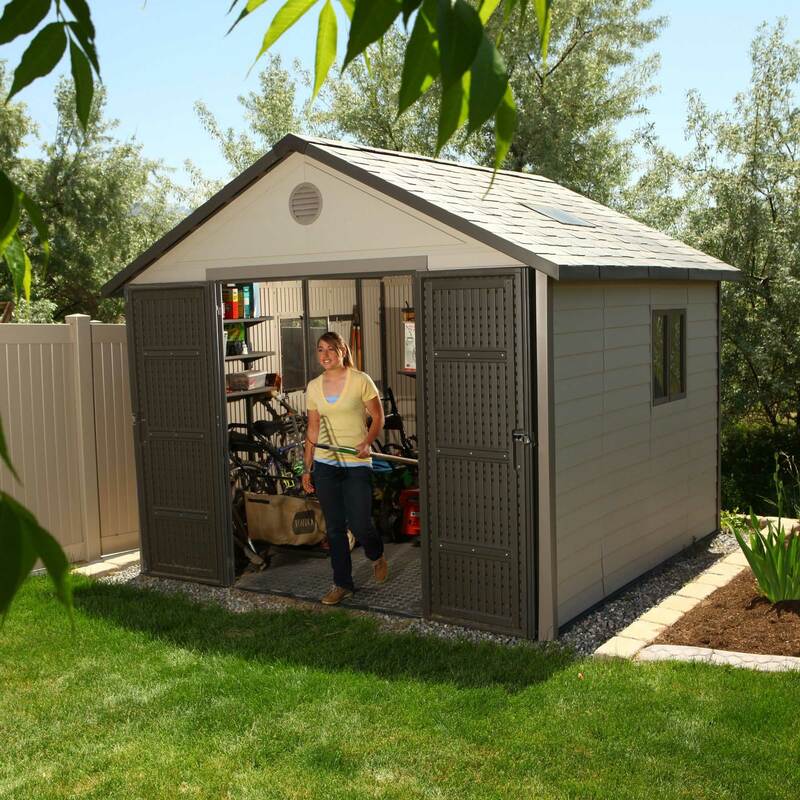 Click to view 6433 Instruction Manual for the 11x11 Plastic Storage Shed with Steel Reinforcements. Assembly is quite simple. Everything is included; however, the most intimidating part may be the surface the shed sits on whether it be concrete or wood. Scroll down to see the basic platform vs wooden base set-up. Assembly should take three people about 4 to 6 hours to complete. We strive to make assembly as easy as possible without compromising quality. 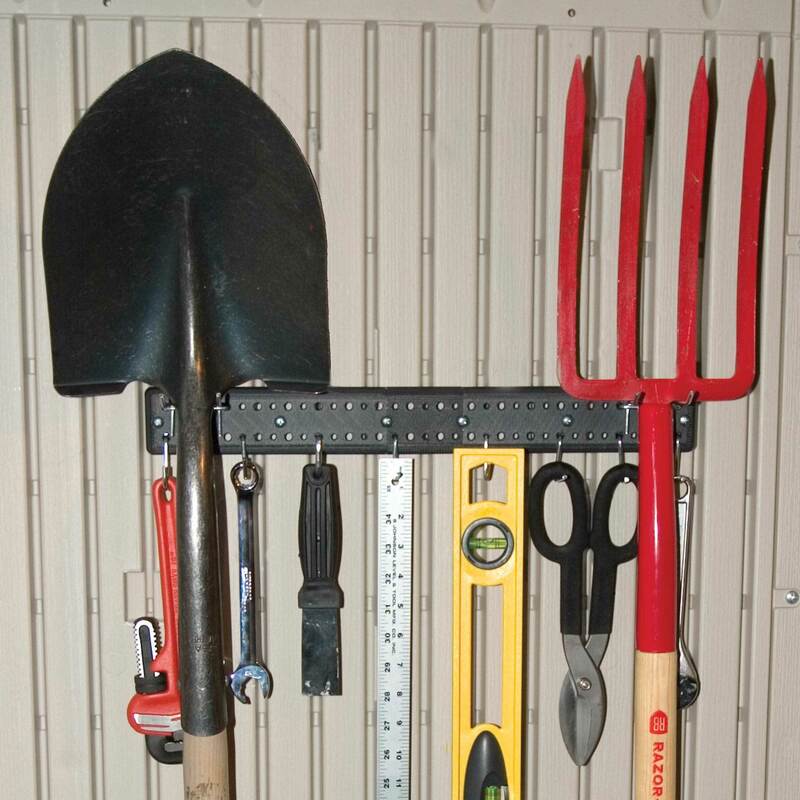 If you get stuck, we have tools to help. 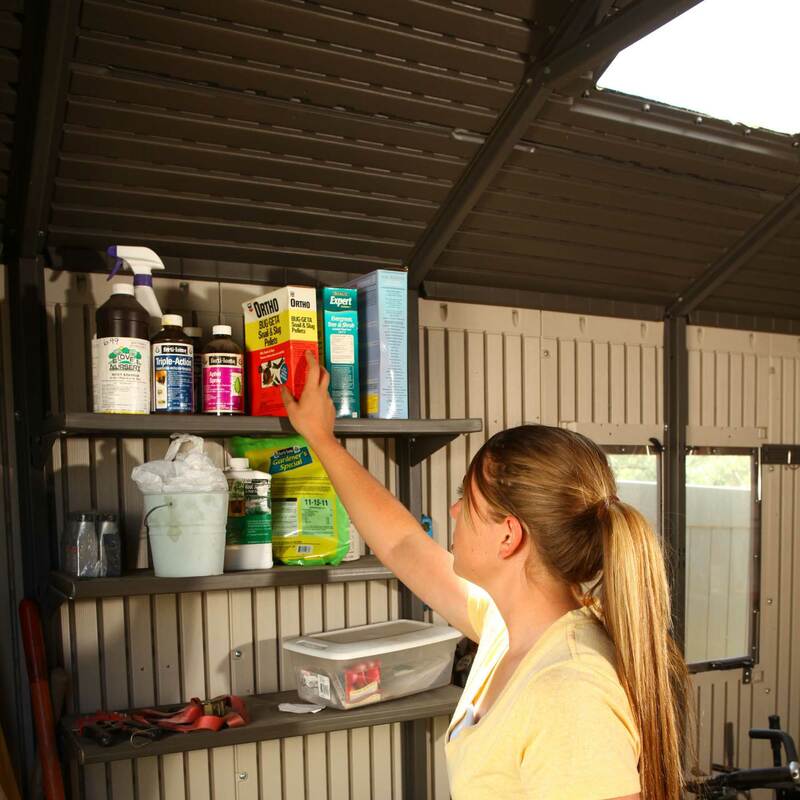 Lifetimes shed assembly experts offer quick responses and great customer service. Available Monday through Friday from 7 AM to 5 PM and Saturday 9 AM to 1 PM Mountain Standard Time. The owners manual is in English, Spanish, and French. There are basically 17 sections which are outlined as follows. The instruction manual also provides instructions on how to register your product (voluntary). The instruction manual also provides the details on the 10 year limited factory warranty. Dimensions: 81" x 33" x 48"